A CONSIDERABLE avalanche danger remains at all elevations above 1,000'. This means human triggered avalanches are likely on slopes 30 degrees and steeper and natural avalanches are still possible. Cornices are huge and could fall, glide cracks are still releasing and storm snow/wet snow avalanches remain concerns. Elevated caution is recommended. Very cautious route finding and conservative decision-making are important if venturing into the mountains today. The danger is MODERATE below 1,000' where debris from an avalanche above may run into channeled terrain. Dangerous avalanche conditions also exist in the Summit Lake area. See this morning's Summit Lake Summary and click HERE for recent observations from the last few days. A special thanks to everyone who attended the 2nd annual Snowball last night at the Taproot!! This was a joint fundraiser between the Alaska Avalanche School and the Friends-CNFAIC and all proceeds directly support avalanche information and education in Alaska! We received a report about a large avalanche triggered in the Harp Mountain area (Eagle River, South Fork) on Thursday, February 25th. This slide caught and carried a skier and buried and killed a dog. Please read the account from one of the members of the party HERE. We are very thankful the people involved are ok and are thankful they are willing to share their story. Today will be the 6th day of stormy weather along Turnagain Pass and the surrounding region. We have seen the rain/snow line fluctuating between 500' and 2,000' and a total precipitation (water) for this six day period of 10" at the Center Ridge SNOTEL station!! That equates to over 10' of snow in less than six days at the upper elevations. That said, our snowpack is well above average at 2,000' - it's just a bit damp. For today, we are expecting a slight break in precipitation before another wave moves in tonight. Around 3-5" of snow is forecast above 1,800' today with rain below and 5-10" of snow tonight above 1,400', again with rain below. Cornices: Natural cornice fall activity is possible and could trigger an avalanche on the slope below. This is something you want to avoid traveling on or underneath. Cornices will be tender and could break farther back than expected. As Aleph said yesterday, falling down the slope with a refrigerator to school bus sized chunk of snow on your snowmachine or skis would be terrible, if not deadly. Storm Slabs: Fluctuating temperatures and snowfall may combine to create storm slabs as new layers of snow are deposited. Pay attention to how well the new snow bonds to the snow below. Wind Slabs: Winds today will continue to add stress to very large wind slabs in leeward terrain. Triggering one of these could be very dangerous due to the depth of slab. Avoid steep wind-loaded slopes. Glide and Wet Avalanches: See below. Glide avalanches still remain a real concern in the area. The many cracks that littler the mid-elevations are hard to see now with the snow filling them in, but there is no mistaking this brown streak on Seattle Ridge. 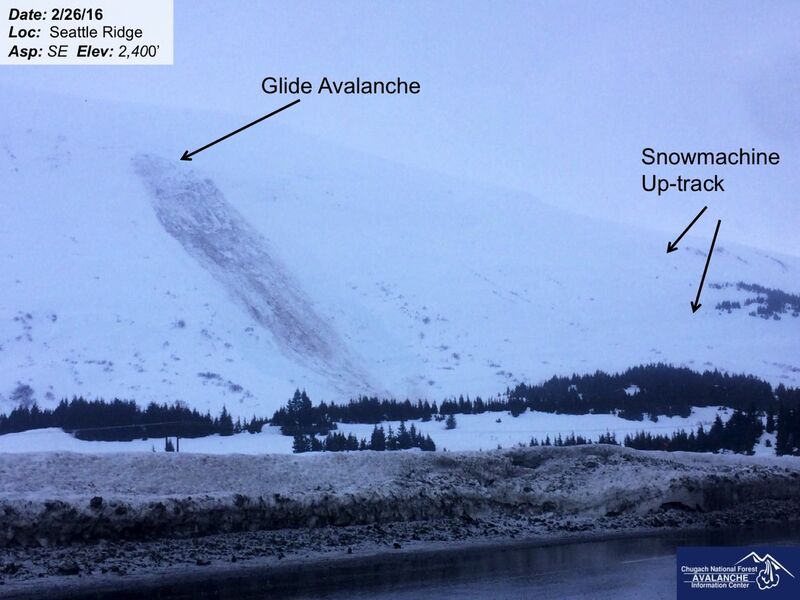 This slide released early yesterday morning and was caught on the RWIS Turnagain Pass camera. Another reason to give avalanche terrain a break for this storm cycle. Rain on the snowpack up to 1,800' today will keep wet avalanche concerns in the forecast. Natural wet loose and wet slab avalanches will be possible in the mid elevation bands and human triggered avalanches are likely in steep terrain. Watch for areas with wet, saturated and unsupportable snow, that is an indication that the snow is losing strength and avoid terrain traps. Wet snow can be very hazardous especially if it gets moving and stuffs you into a bad spot. For today, we have .3-.5" of rain on tap below 1,500' and 3-5" of snow above 1,800' (snow/rain mix between these elevations). Skies should be mostly cloudy and temperatures warming up through the day after dropping to 32F at 1,000' overnight. Ridgetop winds are slated to remain strong, 30-40mph averages with higher gusts from the East. Tonight precipitation should increase with 1-1.5" of water forecast and a rain/snow line dropping slightly to 1,400'. This wet and stormy pattern looks to remain through tomorrow with a 'possible' break on Monday.